Get. In. My. Belly. Seriously, I’m a little sad I saw these this morning, because now it’s all I can think about, but I have zero time to actually make them today. So glad you mentioned adding brewer’s yeast, because when I saw those oats I thought about how great these would be for my supply! Can’t wait to make these. Yum! These look great and I love the ingredients list! What can I substitute for the ground Flax? i think you can probably just add a little extra flour (maybe 2 tablespoons or what if you used oat bran?? i can do that, i have oat bran.i just wanted to use what i have in my cupboard. Hubby will be happy with these for breakfast,thank you. 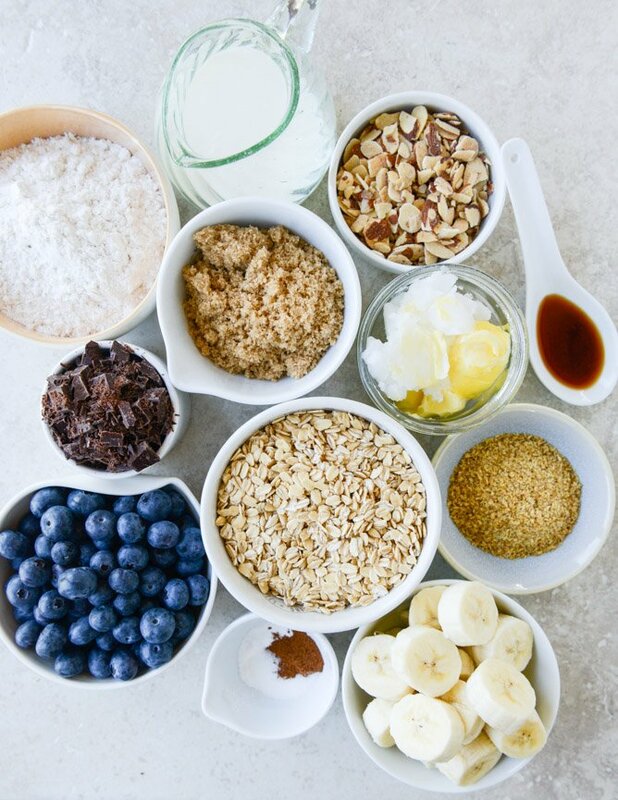 Adding fruit to breakfast cookies is definitely something I need to get into! Love this recipe Jess! these look so awesome! barbara loves oatmeal cookies and these would save me on making breakfast every morning. Ok, uhm, yea. This is so happening this weekend! Thank you for providing me with breakfast for the next week and for doing all the thinking for me. That could get dangerous! Haha, great recipe! These are goooorgeous! And, yes cookies for breakfast win life … also, where there’s oats and nuts … you’re half way to a granola bar aka HEALTH FOOD … #Winning. omg. yum. 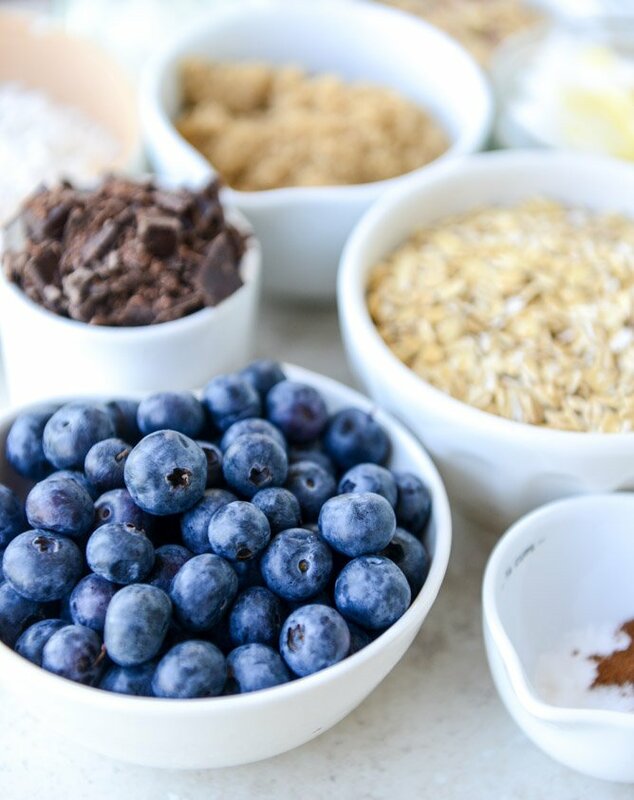 the pictures are gorgeous as usual, but those blueberries though… I was about to run out and get a bagel for breakfast – maybe I should just get some blueberries! umm… totally shoving two of these together with a filling of Häagen-Dazs and calling it a breakfast cookie ICE CREAM SANDWICH. Um, I just shared breakfast NACHOS today, so yeah, I support this breakfast cookie thing full on. These look so good! Love the fresh berries. Cookies for breakfast? I’m always in for that. I’m more of a savory breakfast person as well, but sometimes a girl needs a waffle! :D These look beautiful. I’ll take any excuse to have cookies for breakfast! thanks! They look so delicious! I really love cookies and every morning I bake some of these! Mmm I already love blueberry regular cookies and I make excuses to eat them for breakfast but now I don’t have to kid myself! Oh yes, I love how the world works too. 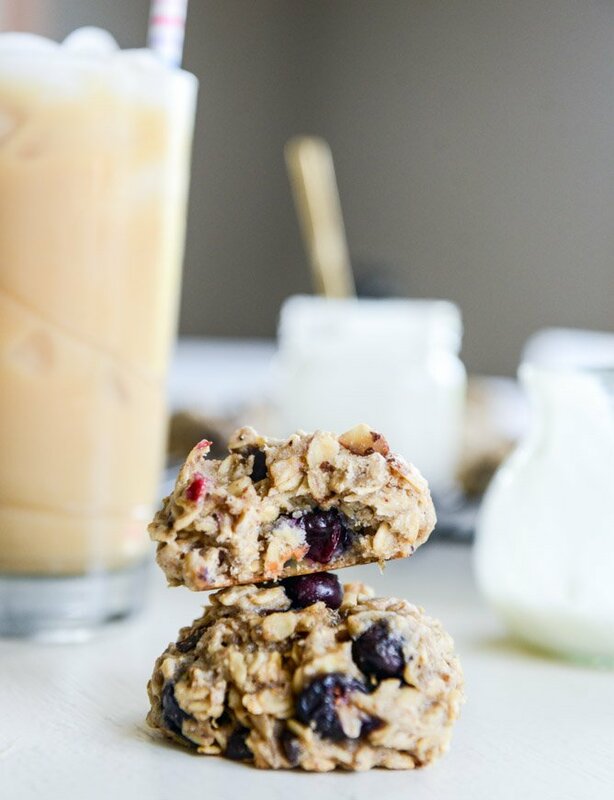 Breakfast cookies are my kind of breakfast food, love these!! These look amazing, nice substitute for the traditional blueberry muffins! Can’t wait to make them. OMG I need these asap. Can I use frozen blueberries? I’ve got some bouncing around in my freezer and, like I said, I NEED these. This looks so delicious! I really want to make this myself. i read your blog everyday, and die over all the amazing recipes you have!! these cookies look amaaaazing. i am just wondering what the bananas do, and if i could do without them (or use something else as a substitute)? i just really dislike them and even when people swear you can’t taste them in a recipe, i can taste them, so i’d like to just omit them if possible. but i wasn’t sure if that would mess up the recipe. just curious! keep posting your amazing food!! I’m wondering about this too! No matter how delicious a banana bread smells or muffin recipe looks, I despise bananas. Have to make these somehow! i think if you omit, you need SOMETHING in it’s place – maybe try yogurt? or do you like pumpkin or squash or sweet potatoes?? This looks so good, can’t wait to make this recipe!! Mmm these look so yummy, I cannot wait to try making these this weekend! These look delicious, I never would have thought to make cookies for breakfast! Oh YUM! 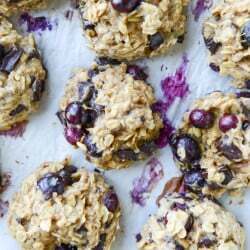 I had some blueberry overnight oatmeal (with coconut, almonds etc) this morning (my way of getting to a fast breakfast for four) so I’m already riding on the blueberry/oat train with you…these look soooo good! Could I use canola oil instead of the coconut oil since I don’t have that type of oil in my pantry. haha I totally love your rationale on the “breakfast food” thing (cookies! donuts! lol) and could certainly go for some of these! These look amazing and a definite must try! I was going to bake your lactation cookies for my (Pittsburgh) buddies who just had a baby – this sounds even better b/c it will force her to eat some for breakfast. blueberries and chocolate sound great together! yum! Any suggestions for a banana substitute? you could maybe try yogurt – or even pumpkin or squash or sweet potato if you like it?! I have to caution… do not make these with overripe bananas like you would use for banana bread… yikes!!! Otherwise they were great but I’m not a fan of that overly strong banana flavor. Yummy. I pinned for future cookie making .